This page covers the author of The Blasphemer. For other authors named John Ling, see the disambiguation page. 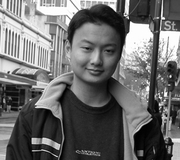 John Ling is a LibraryThing Author, an author who lists their personal library on LibraryThing. John Ling's book The Blasphemer was available from LibraryThing Member Giveaway. "John Ling" is composed of at least 2 distinct authors, divided by their works. You can edit the division. John Ling is composed of 1 name.